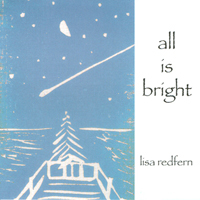 All is Bright is an inspired and uplifting acoustic work featuring 14 sacred songs that resonate the humanity, joy and hope of the first Christmas. Lisa’s unique arrangements reflect a diversity of Americana styles, encompassing bluegrass, country, folk, swing and gospel. Her soul-filled singing creates an intimacy that puts her right there in the room with you.